Arizona Business Leaders Aim High: $600 Million in High-Tech Venture Capital in 9 Years - CREG Tucson Blog, News, Featured Articles, Technology, Bio, Arizona State, Local, National U.S.
We were quite impressed with the ABB’s recent report with a long name: Risk Capital in Arizona: Observations and Recommendations to Accelerate the Growth of the State’s Innovation Economy. As a tenant representative firm, we at Commercial Real Estate Group of Tucson can get behind the goal of the ABB (Arizona Bioscience Board) to make Arizona a top-five destination for bioscience and high-tech industries by 2025. The way to do that, according to the February 2016 report, is to increase venture capital investment in Arizona-based technology-driven companies. ABB, which was formed as a collaborator with the Southern Arizona Leadership Council, sees that as a way to put our economic development into overdrive. If successful, the effort would bring to Arizona some $600 million in total venture capital investment for companies and add jobs through these growing companies. Arizona appears to do OK in attracting angel capital for seeding and start-up, as well as in venture capital investment for commercialization. It’s greatly lacking in midstream growth capital. Arizona isn’t the only state trying to pump up risk capital investment in innovative companies that bring quality jobs to an area. Some 70% of venture capital is invested in three states: New York, Massachusetts and California’s Bay Area anchored by San Francisco. “Proximity to the investment decision-makers at venture funds matters for making, supporting and harvesting equity-based investments,” the report says. In short, geography counts when trying to tap into the significant investment needed to bring ideas to market. Here’s a stark example of this landscape as it affects Arizona. The report says that there is about $20,000 of venture capital managed in the Bay Area per capita, while in Arizona that figure is $50 per capita. Arizona’s per capita rate of venture capital investment is only about 30% of the national average. To meet or exceed that national average, Arizona will need to perform a 300% to 400% increase in securing these investments by the 2025 target. So why would a tech-driven start-up or expansion company want to locate in Arizona when the money it needs is elsewhere? The report has several answers to that question and creates a foundation on which ABB feels it can build upon to support innovative, Arizona-based tech companies. Two of the top 20 angel investors in the United States are in Arizona. Desert Angels, which invests in Southwest start-up and early-stage companies, is located in Tucson. It’s among the top 12 most active angel groups in the country, according to Halo Report 2015. Arizona invests more in early-stage companies than any other state-sponsored business plan competition. The Arizona Innovation Challenge run by the Arizona Commerce Authority invests $3 million annually. Strong collaborative efforts build innovation ecosystems. Players include Arizona’s research universities, government agencies, technology industry groups and the philanthropic sector. Oro Valley’s technology and bioscience concentration, the University of Arizona’s Technology Park and Pima County’s Sonoran Corridor are examples of high-tech concentrations that help individual companies thrive. More than 30 business incubators are headquartered in Arizona. More than 10% of the Arizona Business Incubation Association’s membership is based in Tucson. Arizona’s top two research universities have commercialization initiatives with experienced leaders. The University of Arizona’s Tech Launch Arizona helps connect potential investors with companies launched by and from UA-based researchers and developers. particularly those in the Bay Area, to connect with Arizona-based tech companies. companies that can attract venture capital. What’s next? ABB co-chair Mara G. Aspinall says a wide range of sectors will need to work together to implement the plan: business groups, chambers, the legislature and private industry. The state legislature recently tossed in a contribution to the effort. A new law exempts venture capital managers from needing to register as investment advisers. It removes a small roadblock that discouraged out-of-state venture capital firms from opening offices in Arizona. One thing we found lacking in the plan was a suggestion of an entity that would take on a leadership role. Who will spur action on the recommendations? What will corral all the different efforts to push toward this singular goal? We hope that gets sorted out soon. We believe Arizona is already on its way to becoming a Southwest hub for high-tech industries. A collaborative effort on all levels can make it happen in a big way. 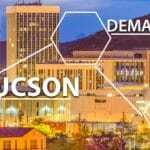 Learn More: Risk Capital in Arizona: Observations and Recommendations to Accelerate the Growth of the State’s Innovation Economy. Commercial Real Estate Group of Tucson specializes in representing tenants and corporate users across the United States. For more information call +1-520-299-3400.